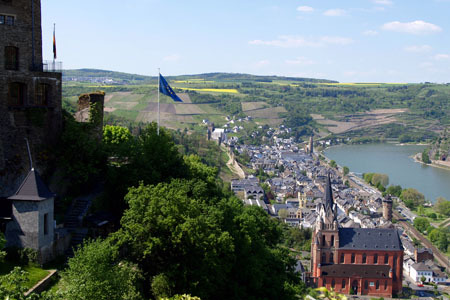 The unique qualities of the 65 km long upper part of the middle-Rhine valley between Bingen and Koblenz, gives it special importance. It is an excellent example of a cultural landscape, which in times past sometimes acted as a barrier between cultures, but also one that connected diverse cultures to each another. It is closely linked to the development of the West; a place where there is significant evidence of art, urban development, and history, as well as a close interaction between man and nature at every turn. Here is a cultural landscape whose lively history reflects the spiritual, artistic, and literary life of Europe as no other European cultural landscape can. For this reason, it was entered in the World Heritage list of UNESCO on 27 June 2002 and this decision was accepted by the people with much enthusiasm and celebrated with a grand folk festival along the Rhine. The only international airport in Rhineland-Pfalz is in the Rhine-Hunsrück area. Hahn airport is officially called Frankfurt-Hahn Airport due to its close connection to the main airport at Frankfurt. It was originally a US Air Force base, which was closed in 1993. The results of the largest conversion project ever undertaken in the country are evident: the freight department of the airport is now the fourth largest in the country, and the number of passengers is steadily increasing. In 2002, there were already about 1.5 million passengers. This is likely to increase to several million passengers per year thanks to Ryanair's (an Irish airline) decision to open a branch at Hahn airport. The airport functions as the business engine and main provider of jobs for the region. It has generated more than 2,200 new jobs so far. The economic backbone of the region of the Rhine and Hunsrück heights consists of several thousands of solid, middle-sized businesses, while large businesses, to a great extent, fail. One important economic sector is handwork. Over 1,100 handwork businesses offer work to almost 8,000 employees in the Rhine-Hunsrück district. Affordable land prices in increasingly convenient locations (good connections to the A61 autobahn, as well as to the planned federal highways B50 and B327) offer an attractive environment for various kinds of businesses. In addition, a large number of motivated, ambitious, and highly qualified workers can be found in this region. Another important factor is the prospects that the Frankfurt- Hahn airport offers to business and tourism in Hunsrück. The structure of agriculture in the Rhine-Hunsrück district has changed a lot over the last thirty years. The decrease in the number of farms is especially noticeable: in 1971, there were 5,039 farms, while in 2001 there were only 1,322 farms where the farmers worked either part- or full-time. At the same time, farming took on a new form. The percentage of full-time farmers fell from 42.1% to 18.9%. The amount of land used for farming reduced only slightly, meaning that farms today are much larger than just a few decades ago. While in the past almost every family in a village farmed, today there are villages with no farmers living there. The decline in farming is also reflected in animal husbandry. Between 1970 and 2001, the number of cattle fell from 58,000 to 21,000, a reduction of more than one-third. Farms with just a few head of cattle are rare today. There have also been structural changes in the profile of vineyards in the area. In 1971, in the central Rhine valley of the Rhine-Hunsrück district, there were 256 hectares of land planted with grapes, while in 2002 there were only 148 hectares.